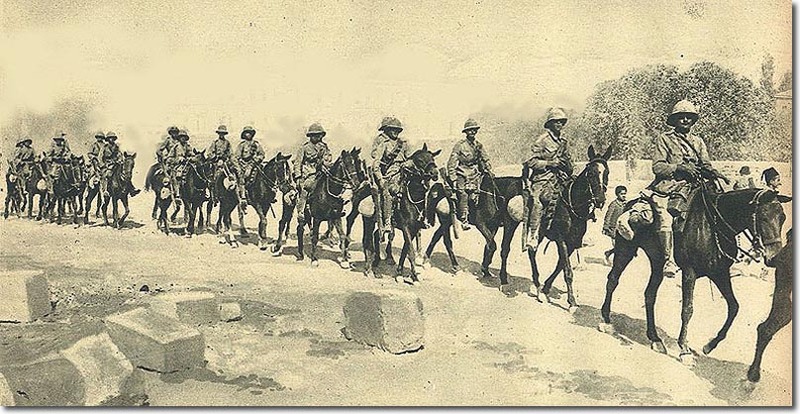 While cavalry on the Western Front were for the most part required to fight the Germans on foot, in the Middle East and Mesopotamia the war against the Turks covered large areas and cavalry on horseback were able to move quickly. Feeding the horses was a problem and the men here have bags of feed attached to their saddles just behind their Lee-Enfield rifles. The officer in leather riding boots rides at the front of his men, all wearing the Wolseley helmet.